The retail market has come full circle since the Great Recession by ending 2018 with its lowest vacancy rate in a decade, according to research firm Applied Analysis, which credits home construction and population growth for increasing demand. The office market showed similar gains with its lowest vacancy rate since the fourth quarter of 2008. The industrial market continued to add millions of square feet of space to meet demand. But it’s retail that showed some impressive gains. By the end of the fourth quarter, the direct retail vacancy rate dropped to 7.6 percent, the lowest it has been since the third quarter of 2008, the firm noted. In 2018, about 514,400 square feet of anchored retail space was completed, bringing total inventory to more than 54.4 million square feet, according to Applied Analysis. The fourth quarter accounted for more than half of the annual tally of new inventory with the completion of three projects totaling 286,000 square feet. That includes the 150,000-square-foot Costco at St. Rose Square in Henderson. Rainbow Warm Springs Center completed construction on its 85,000-square-foot neighborhood center anchored by Sprouts Farmers Market at 7455 S. Rainbow Blvd. in the southwest valley. In addition, Mountain’s Edge Marketplace wrapped up construction on 51,000 square feet of additional pad space at 7955 Blue Diamond Road in the southwest valley, the firm reported. Applied Analysis Principal Brian Gordon said the retail market “has managed to string together nearly a decade of improving vacancy rates” and Southern Nevada “has continued to outpace similarly-sized cities in terms of both population and employment growth.” That has contributed to the ongoing demand for housing in the area, he added. The retail market reported positive net absorption throughout each quarter of 2018, bringing the annual total to 674,500 square feet of net move-ins, according to Applied Analysis. During the fourth quarter, Lost Worlds Adventures leased 28,000 square feet of space at Foothills Plaza, 11450 West Horizon Ridge Parkway. Additionally, HomeGoods leased 23,200 square feet at Centennial Center, 8060 West Tropical Parkway. La Bonita Supermarkets subleased 49,100 square feet at Green Valley Town & Country, 2823 North Green Valley Parkway. BioLife Plasma Services subleased about 16,000 square feet at Parkway Springs Plaza, 2277 North Green Valley Parkway, the firm reported. The year ended with 705,900 square feet of retail projects under construction. The second phase of St. Rose Square broke ground during the quarter. The Costco-anchored center will feature roughly 316,000 square feet of additional pad and anchor space. The 90,000-square-foot Las Vegas Athletic Club at UnionPlaza in Henderson was wrapping up construction and the 69,000-square-foot Maya Cinemas in North Las Vegas has opened. Improving demand contributed to further declines in the market-wide vacancy rate, reaching its lowest level since the fourth quarter of 2008. At the end of 2018, the office market vacancy rate stood at 17.0 percent, down 0.9 percentage points from the fourth quarter of 2017, according to Applied Analysis. The office market had about 101,300 square feet of positive net absorption in the final quarter of 2018, bringing the total for the year to 1.1 million square feet of net move-ins. Selected leases during the latest quarter included Assured Healthcare Systems occupying 11,600 square feet at 2870 S. Maryland Parkway, Australis Capital leasing 7,400 square feet at 376 E. Warm Springs Road and the Teamsters Union No. 14 leasing 6,100 square feet of office space at 8951 W. Sahara Ave., the firm reported. While no office buildings completed construction during the fourth quarter, deliveries for the year totaled 671,900 square feet, a slight decline from a year ago. The notable completions in 2018 included the 180,000-square-foot Aristocrat Headquarters, Two Summerlin (152,300 square feet), Sansone St. Rose Coronado (62,300 square feet) and several smaller-scale projects across the valley, bringing total office inventory to over 55.9 million square feet, according to Applied Analysis. Construction activity increased to 244,100 square feet at the end of 2018. 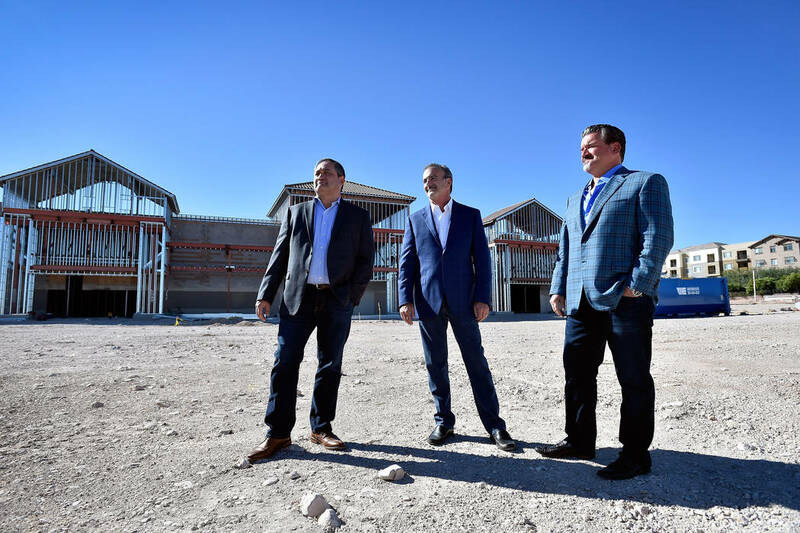 During the quarter, construction began at the fourth phase of the 48,000-square-foot Cimarron Courtyard office condos in the southwest valley. There’s construction at the UNLV Technology Park, which will add 110,700 square feet of inventory to the market upon its completion in 2019. In addition, construction activity includes University Gateway (25,000 square feet) near UNLV, the firm reported. Gordon said the market average pricing reached the $2 per square foot threshold in 2018 for the first time since 2011. Continued employment expansion and business expansion has helped “press the office market forward,” he said. “During the past year, the Las Vegas market welcomed an estimated 6,600 employees within the professional and business services sector. Investments outside of the tourism and construction sector will be important to the longer-run recovery of the real estate market and increased stability of the overall economy,” Gordon said. Applied Analysis Project Manager Melanie Framo said that while the vacancy rate has continued to decrease, the number of active commercial office construction projects has slowed substantially in recent quarters as several wrapped up construction. Major construction projects such as the UNLV Technology Park, however, will continue to have a notable impact on absorption rates in the future, Framo said. In addition, build-to-suit projects are expected to bolster the local office market, she added. “The Raiders team headquarters is expected to add 150,000 square feet of space to the south submarket, while Boyd Gaming’s planned headquarters would add up to an additional 640,000 square feet of build-to-suit office space to the southwest submarket,” Framo said. The industrial vacancy rate increased by the end of 2018 with the addition of new space. There was 4.3 million square feet of absorption in the marketplace in 2018 when 3.8 million square feet of space was added, the firm noted. With this new inventory, the vacancy rate during the fourth quarter edged up to 6.9 percent from the third quarter. It’s still 0.6 percent points lower than the fourth quarter of 2017, according to Applied Analysis. During the fourth quarter, four industrial projects completed construction bringing the total industrial inventory to 125.3 million square feet. Switch, located at the southeast corner of Warm Springs Road and Lindell Road in the southwest valley, completed construction of its latest data center. Prologis Warm Springs Freeway Business Center completed construction of its 224,800-square-foot distribution center, 2830 W. Capovilla Ave. in the east valley. Airparc South completed construction on eight distribution buildings, 1550 Executive Airport Drive, by adding 212,000 square feet of inventory to the industrial market. In addition, Craig @ Walnut completed construction on its 122,500-square-foot distribution center on the southeast corner of Craig Road and Walnut Road in northeast valley, according to Applied Analysis. The industrial market reported 810,200 square feet of net absorption during the fourth quarter, the firm reported. Harsch Speedway Commerce Center III Building A located, 6335 N. Hollywood Drive in the northeast, reported a lease of 156,500 square feet to Matheson Trucking. Eachpole Inc. leased 95,500 square feet at Northgate Distribution Center Building No. 5, 5840 Donovan Way in the northeast valley. DC Solar Solutions Inc. leased 71,000 square feet at Pacific Business Center No. 4 located, 1070 Mary Crest Road in Henderson, the firm reported. The industrial market ended 2018 with 6.7 million square feet of industrial space under construction. Tropical Distribution Center Buildings A and B in the north valley also continued construction on 1.6 million square feet of distribution space for their tenants, Amazon and Sephora, the firm noted. The West Craig Distribution Center Buildings A, B and C in the north valley began construction during the fourth quarter and will add 340,900 square feet of inventory when completed, the firm reported. Gordon said the industrial market saw “significant growth in 2018” and the market continues to experience “impressive levels of demand.” Due to the increased supply of industrial inventory, the vacancy rate remained flat during the year, he said. Framo said development activity in the Las Vegas industrial market has been picking up pace with 6.7 million square feet of inventory under construction at the end of 2018. While large tenants are expected to occupy a number of buildings, there’s the potential for some softening in overall vacancies, she added.